Is Finding a Wedding Dress Like Looking for a Husband? I wondered if finding a wedding dress was like looking for your soulmate, or maybe more so husband and life partner. How much time and effort do you give it? Do you sleep on a decision or continue trying on the next one? I went wedding dress shopping again. This time, it wasn't about me. My friend from college wanted me to come along her quest. I wasn't sure how to act -- should I be overenthusiastic about one that was flattering for her body, skin tone? Do we go with the theme she thinks she wants? Do I appear adamant with something she likes but I don't? Like on the TLC shows, do I become the disapproving mom, cheerleader sister or emotional dad? I'd never done this before as the helper, having only taken my cousin with me to a sample sale a few days after the engagement and bought the fourth dress I tried on. Good price but there was no walk down the aisle. As for my friend, she knew she didn't want bright white. That's a start. I made sure we got a variety in color and style. One that looked dreamy on the hangar wasn't so great off it. She glowed in one but vocalized she loved another. Adding sashes and headbands changed the whole look. She didn't try on a sparkly number at all because it was over her budget. I had mixed feelings about that -- thinking, what if she fell in love with that one in particular but she would never know? Couldn't she take the risk and splurge? A couple were pretty fine, but my friend said she didn't know if she was supposed to wait for that moment when you just know "this is the one." How to respond -- she already had found "the one" she was going to marry and here I was, thrilled for her but single and without answers. I wondered if finding a wedding dress was like looking for your soulmate, or maybe more so husband and life partner. How much time and effort do you give it? Do you sleep on a decision or continue trying on the next one? As with men, is it important to have a smaller selection, settle for certain characteristics or wait around for feelings to develop? Why do so many of us take someone with us particularly when wedding dress shopping or try to illicit implicit approval when we introduce our boyfriends to others? Do we not trust ourselves when it comes to the big purchases, literal and figurative? Some women tie themselves to certain characteristics like strapless or religion and then a dress (err, significant other) comes along that makes an exception. Dating coaches and matchmakers are like clothing store associates. When you walk in, they ask if you are just looking or trying to find something specific. Some of them cater to your needs, others make suggestions if you're open-minded. Maybe if in real life we were more clear in our purchase priorities, we would be more efficient. 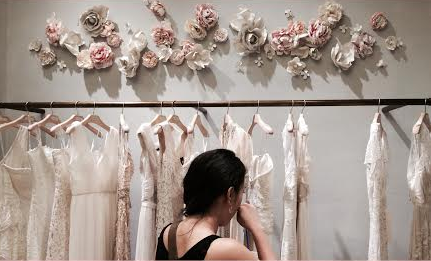 I mean, you don't go wedding dress shopping unless you're in a serious relationship. Obviously a dress is an inanimate object. At best, what we wear highlights our essence and makes us put our best Cinderella foot forward. And who we wear on our arms should be complimentary, too. Some styles insensibly make sense and others are outright not the right fit. Truth be told, we could don any multitude of dresses and it could be good enough. Sometimes there needs to be some compromise and you can't have all you thought you could check off a list. It's difficult to strive for perfection. What we put on matters more when it's hindering our happiness, like causing us to fidget in a strapless or itching in lace or dragging in fabric. To stretch the metaphor, think personality ticks or relationship baggage. We left the store empty-handed. She's, after all, less impulsive than I am. A few days later, I asked if she made a decision. Despite wanting to narrow the rest of her wedding details down, she will wait. Nothing spoke to and stuck with her. She has time. I wonder if she'll experience the eureka moment when everything clicks, when everything feels like it's falling in place. But maybe we shouldn't expect it, either and just hope for the best. I want my girlfriend to look back on her wedding day and think happy moments. No matter what she wears, she'll be surrounded by flowers and the love from her fiancé, friends and family. I want her to feel as beautiful the day she starts her married life and I'm crossing my fingers the other "one" (dress) will cross her clothing rack path. Even if she finds it on her own, I'm here to take a look. As for me, my somewhat out-of-place, once-worn dress with a story to tell still hangs in my closet. I think it's time I really try to sell it or something, so I can start saving up for my friend's wedding.